Falling Water Designs » Is Algae Growing In Your Pond? Is Algae Growing In Your Pond? I’ve got algae in my pond. Now what? This is a free swimming algae that grows in warm water and turns the water a pea-soup green color so you can’t see the bottom or the fish. Also known as Hair or String Algae or “mossy” algae. It is fixed in place and grows like coral, one body on top of the other until it creates large long strings. This type of algae likes moving water and will grow in the areas that have the most current. This algae grows on the sides of the pond and on any wet surface including the rocks. This algae is actually beneficial for the pond. It helps moderate the PH of the water, it provides oxygen for the fish and they eat it. It also competes for the same food that the other types of algae want. Algae growing in the oceans of the world produce more oxygen than all the trees on all the continents and are also eaten by fish so it is beneficial but unsightly in our ponds. Algae are like dandelions in your lawn. Given light and fertilizer the algae will grow until a more beneficial organism competes for the light and the fertilizer. To combat algae in our ponds we remove the light and/or the fertilizer. Shade the water in the pond by using a water tint. Cover the surface of the pond by installing aquatic plants that take up about 60-70% of the surface of the pond. Do not cover more than 70% of the surface because gas exchange must be able to occur. Install a biological filter that grows beneficial bacteria. 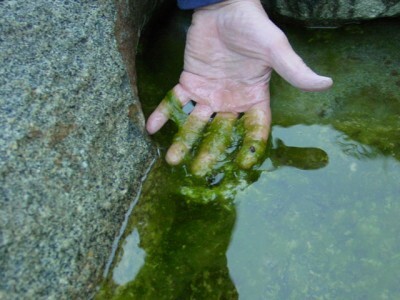 The beneficial bacteria consume the “fertilizer” that the algae would otherwise consume thus starving the algae. Set up a UV sterilizer for guaranteed results with planktonic algae and to sterilize the pond water and kill other harmful organisms that can attack your fish. 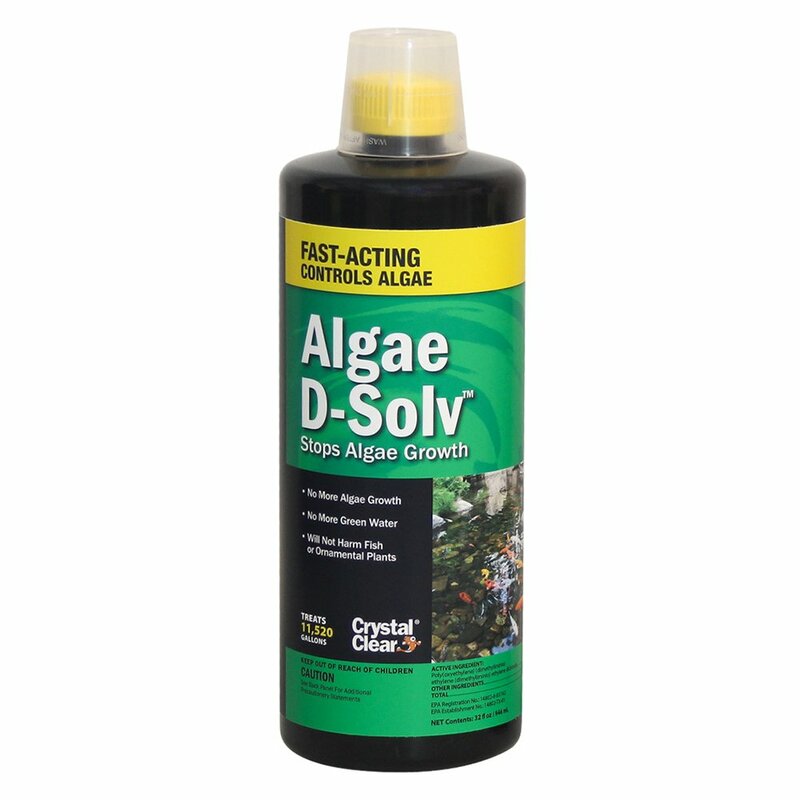 • Use CrystalClear Algae D-Solv. We have assorted sizes available for purchase at Falling Water Gardens. How do I calculate my pond’s gallonage? Calculating the gallonage of your pond is easy. Simply multiply the average length x the average width x the average depth x 7.5 and the result will give you the number of gallons. Easy! And now you know. Have more questions? Call the nursery: 360-863-1400 or email us at info@FallingWaterDesigns.com.